The Education Department has awarded more than $250 million in charter grants to states, charter management organizations, and agencies that help finance the costs of building new schools. Charter management organizations that won replication grants are a who’s who of the charter world, including the latest two winners of the Broad Prize for public charter schools, IDEA Public Schools in Texas and Success Academy in New York. 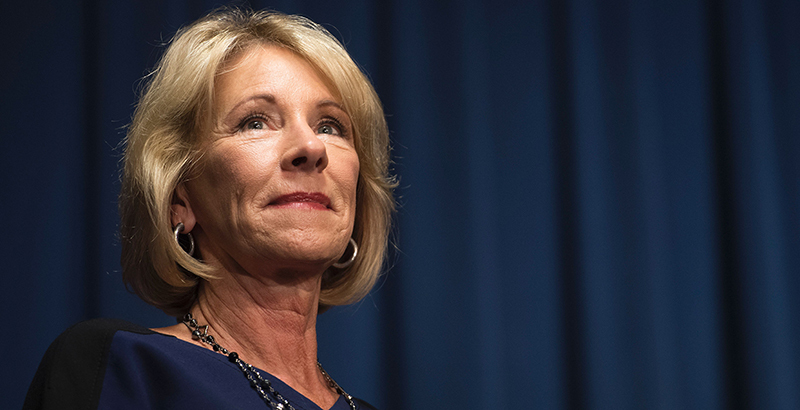 Increased funding for the federal charter school program has been the one Trump administration school choice program that has found traction in recent budget debates. House lawmakers voted to give the program $370 million in their recently passed budget proposal, while a Senate committee approved $367 million. The administration had requested $500 million. “While these grants are critical, they fall far short of the need. We urge the administration and Congress to work together to boost the amount of [charter school] funding available to meet the demand for more and better public school options,” Nina Rees, president and CEO of the National Alliance for Public Charter Schools, said in a release. Other charter management winners are: Ascend Learning (New York), Brooke Charter School (Massachusetts), Eagle Academy (Washington, D.C.), East Harlem Tutorial Program (New York), Environmental Charter Schools (California), Family Life Academy Charter Schools (New York), Fortune Schools of Education (California), Freedom Preparatory Academy (Tennessee), Great Oaks Foundation (New York), Hiawatha Academies (Minnesota), New Paradigm for Education (Michigan), Rocketship Education (California), Freedom and Democracy Schools Foundation (Maryland), University Prep (Colorado), and Voices College-Bound Language Academies (California). The CMOs will get a total of about $52 million, though the department said they should receive about $127 million, if Congress appropriates additional money. The state funding went to Indiana, Maryland, Minnesota, Mississippi, New Mexico, Oklahoma, Rhode Island, Texas, and Wisconsin. The state agencies will get a total of about $145 million, though the agency recommended they should get about $332 million. Funds to help startup charter schools raise the capital needed to open buildings went to organizations in Washington, D.C., California, Maryland, North Carolina, Mississippi, California, Massachusetts, and Arizona. They’ll share about $57 million. Disclosure: Campbell Brown, The 74’s co-founder, sits on Success Academy’s board of directors.